What are ankylosing spondylitis symptoms and signs? What specialties of health care professionals treat ankylosing spondylitis? What are home remedies for ankylosing spondylitis? What tests do health care professionals use to diagnose ankylosing spondylitis? What are ankylosing spondylitis treatment options? What is the prognosis for patients with ankylosing spondylitis? Is it possible to prevent ankylosing spondylitis? What is in the future for patients with ankylosing spondylitis? Where can people find more information about ankylosing spondylitis and learn about support groups? Ankylosing spondylitis is a form of arthritis featuring chronic inflammation of the spine and the sacroiliac joints. Ankylosing spondylitis belongs to a group of arthritis conditions that tend to cause chronic inflammation of the spine (spondyloarthropathies). Ankylosing spondylitis affects males two to three times more commonly than females. The tendency to develop ankylosing spondylitis is genetically inherited. The HLA-B27 gene can be detected in the blood of most patients with ankylosing spondylitis. Ankylosing spondylitis can also affect the eyes, heart, lungs, and occasionally the kidneys. The optimal treatment of ankylosing spondylitis involves medications that reduce inflammation or suppress immunity, physical therapy, and exercise. Ankylosing spondylitis is a form of chronic inflammation of the spine and the sacroiliac joints. The sacroiliac joints are located at the base of the low back where the sacrum (the bone directly above the tailbone) meets the iliac bones (bones on either side of the upper buttocks) of the pelvis. Chronic inflammation in these areas causes pain and stiffness in and around the spine, including the neck, middle back, lower back, and buttocks. Over time, chronic inflammation of the spine (spondylitis) can lead to a complete cementing together (fusion) of the vertebrae, a process referred to as ankylosis. Ankylosis causes loss of mobility of the spine. Ankylosing spondylitis is also a systemic disease, meaning it can affect tissues throughout the body, not just the spine. Accordingly, it can cause inflammation in and injury to other joints away from the spine manifest as arthritis, as well as to other organs, such as the eyes, heart, lungs, and kidneys. Ankylosing spondylitis shares many features with several other arthritis conditions, such as psoriatic arthritis, reactive arthritis (formerly called Reiter's disease), and arthritis associated with Crohn's disease and ulcerative colitis. Each of these arthritic conditions can cause disease and inflammation in the spine, other joints, eyes, skin, mouth, and various organs. In view of their similarities and tendency to cause inflammation of the spine, these medical conditions are collectively referred to as "spondyloarthropathies." Ankylosing spondylitis is considered one of the many rheumatic diseases because it can cause symptoms involving muscles and joints. Ankylosing spondylitis is two to three times more common in men than in women. In women, joints away from the spine are more frequently affected than in men. Ankylosing spondylitis affects all age groups, including children. When it affects children, it is referred to as juvenile ankylosing spondylitis. The most common age of onset of symptoms is in the second and third decades of life. Ankylosing spondylitis is often abbreviated AS and has been referred to as Bechterew's disease. The tendency to develop ankylosing spondylitis is believed to be genetically inherited, and a majority (nearly 90%) of people with ankylosing spondylitis are born with a gene known as the HLA-B27 gene. Blood tests have been developed to detect the HLA-B27 gene marker and have furthered our understanding of the relationship between HLA-B27 and ankylosing spondylitis. The HLA-B27 gene appears only to increase the tendency of developing ankylosing spondylitis, while some additional factor(s), perhaps environmental, are necessary for the disease to appear or become expressed. For example, while 7% of the United States population has the HLA-B27 gene, only 1% of the population actually has the disease ankylosing spondylitis. In northern Scandinavia (Lapland), 1.8% of the population has ankylosing spondylitis while 24% of the general population has the HLA-B27 gene. Even among individuals whose HLA-B27 blood test is positive, the risk of developing ankylosing spondylitis appears to be further related to heredity. In HLA-B27-positive individuals who have relatives with the disease, the risk of developing ankylosing spondylitis is 12% (six times greater than for those whose relatives do not have ankylosing spondylitis). Other genes have been identified that are associated with ankylosing spondylitis, including ARTS1 and IL23R. These genes seem to play a role in influencing immune function. It is anticipated that by understanding the effects of each of these known gene risk factors medical researchers will make significant progress in discovering a cure for ankylosing spondylitis. How inflammation occurs and persists in different organs and joints in ankylosing spondylitis is a subject of active health research. Each individual tends to have their own unique pattern of presentation and activity of the illness. The initial inflammation may be a result of an activation of the body's immune system, perhaps by a preceding bacterial infection or a combination of infectious microbes. Once activated, the body's immune system becomes unable to turn itself off, even though the initial bacterial infection may have long subsided. Chronic tissue inflammation resulting from the continued activation of the body's own immune system in the absence of active infection is the hallmark of an inflammatory autoimmune disease. The symptoms of ankylosing spondylitis are related to inflammation of the spine, joints, and other parts of the body. Fatigue is a common symptom associated with active inflammation. Inflammation of the spine causes pain and stiffness in the low back, upper buttock area, neck, and the remainder of the spine. The onset of pain and stiffness is usually gradual and progressively worsens with loss of range of motion noticeable over months. Occasionally, the onset is rapid and intense. Lumbar pain (low back pain) and buttock pain are common manifestations of active inflammation in the lumbar spine and sacroiliac joints. The symptoms of pain and stiffness are often worse in the morning or after prolonged periods of inactivity. Motion, heat, and a warm shower often reduces pain and stiffness in the morning. Because ankylosing spondylitis often affects adolescents, the onset of low back pain is sometimes incorrectly attributed to athletic injuries in younger patients. People with ankylosing spondylitis can also have arthritis in joints other than the spine. This feature occurs more commonly in women. Patients may notice pain, stiffness, heat, swelling, warmth, and/or redness in joints such as the hips, knees, and ankles. Occasionally, the small joints of the toes can become inflamed or "sausage" shaped. Inflammation can occur in the cartilage around the breastbone (costochondritis) as well as in the tendons where the muscles attach to the bone (tendinitis) and in ligament attachments to bone. Some people with this disease develop Achilles tendinitis, causing pain and stiffness in the back of the heel, especially when pushing off with the foot while walking upstairs. Inflammation of the tissues of the bottom of the foot, plantar fasciitis, occurs more frequently in people with ankylosing spondylitis. A rare complication of ankylosing spondylitis involves scarring of the heart's electrical system, causing an abnormally slow heart rate (referred to as heart block). A heart pacemaker may be necessary in these patients to maintain adequate heart rate and output. In others, the part of the aorta closest to the heart can become inflamed, resulting in leakage of the aortic valve. In this case, patients can develop shortness of breath, dizziness, and heart failure. Health care professionals who treat ankylosing spondylitis include primary care doctors, internists, family practitioners, and general-medicine doctors, as well as orthopedists. Rheumatologists are internal-medicine subspecialists with a particular interest in diagnosing and treating patients with ankylosing spondylitis. Physical therapy for ankylosing spondylitis includes instructions and exercises to maintain proper posture. This includes deep breathing for lung expansion and stretching exercises to improve spine and joint mobility. Since ankylosis of the spine tends to cause forward curvature (kyphosis), patients are instructed to maintain erect posture as much as possible and to perform back-extension exercises. Patients are also advised to sleep on a firm mattress and avoid the use of a pillow in order to prevent spine curvature. Ankylosing spondylitis can involve the areas where the ribs attach to the upper spine as well as the vertebral joints, thus limiting breathing capacity. Patients are instructed to maximally expand their chest frequently throughout each day to minimize this limitation. Physical therapists customize exercise programs for each individual. Swimming often can be a very beneficial form of exercise, as it avoids jarring impact of the spine. Ankylosing spondylitis need not limit an individual's involvement in athletics. People can participate in carefully chosen aerobic sports when their disease is inactive. Aerobic exercise is generally encouraged as it promotes full expansion of the breathing muscles and opens the airways of the lungs. Cigarette smoking is strongly discouraged in people with ankylosing spondylitis, as it can accelerate lung scarring and seriously aggravate breathing difficulties. Occasionally, those with severe lung disease related to ankylosing spondylitis may require oxygen supplementation and medications to improve breathing. People with ankylosing spondylitis may need to modify their activities of daily living and adjust features of the workplace. For example, workers can adjust chairs and desks for proper postures. Drivers can use wide rearview mirrors and prism glasses to compensate for the limited motion in the spine. The diagnosis of ankylosing spondylitis is based on evaluating the patient's symptoms, a physical examination, X-ray findings (radiographs), and blood tests. Stiffness, pain, and decreased range of motion of the spine are characteristic of the inflammatory back pain of ankylosing spondylitis. Symptoms include pain and morning stiffness of the spine and sacral areas with or without accompanying inflammation in other joints, tendons, and organs. Early symptoms of ankylosing spondylitis can be very deceptive, as stiffness and pain in the low back can be seen in many other conditions. It can be particularly subtle in women, who tend to (though not always) have more mild spine involvement. Years of disease can pass before the diagnosis of ankylosing spondylitis is even considered. The examination can demonstrate signs of inflammation and decreased range of motion of joints. This can be particularly apparent in the spine. Flexibility of the low back and/or neck can be decreased. There may be tenderness of the sacroiliac joints of the upper buttocks. Chest expansion with full breathing can be limited because of rigidity of the chest wall. Severely affected people can have a stooped posture. Inflammation of the eyes can be evaluated by the doctor with an ophthalmoscope. Further clues to the diagnosis are suggested by X-ray abnormalities of the spine and the presence of the genetic marker HLA-B27 identified by a blood test. Other blood tests may provide evidence of inflammation in the body. For example, a blood test called the sedimentation rate is a nonspecific marker for inflammation throughout the body and is often elevated in inflammatory conditions such as ankylosing spondylitis. X-ray tests of the sacroiliac joints can demonstrate signs of inflammation and erosion of bone. 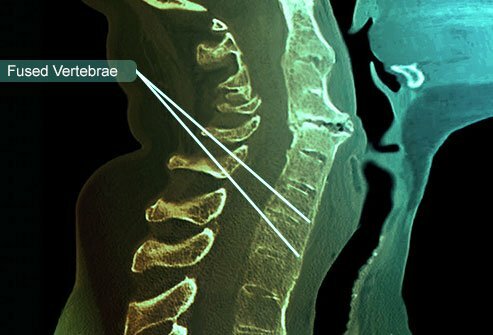 X-rays of the spine can progressively demonstrate straightening, "squaring" of the vertebrae, and end-stage fusion of one vertebra to the next (ankylosis). Fusion up and down the spine can lead to a "bamboo spine" appearance on X-ray tests with complete loss of mobility. Urinalysis is often done to look for accompanying abnormalities of the kidney as well as to exclude kidney conditions that may produce back pain that mimics ankylosing spondylitis. Patients are also simultaneously evaluated for symptoms and signs of other related spondyloarthropathies, such as psoriasis, venereal disease, dysentery (reactive arthritis or Reiter's disease), and inflammatory bowel disease (ulcerative colitis or Crohn's disease). The treatment of ankylosing spondylitis typically involves the use of medications to reduce inflammation and/or suppress immunity to stop progression of the disease, physical therapy, and exercise. Medications decrease inflammation in the spine and other joints and organs. Physical therapy and exercise help improve posture, spine mobility, and lung capacity. Aspirin and other nonsteroidal anti-inflammatory drugs (NSAIDs) are commonly used to decrease pain and stiffness of the spine and other joints. Commonly used NSAIDs include indomethacin (Indocin), tolmetin (Tolectin), sulindac (Clinoril), naproxen (Naprosyn), and diclofenac (Voltaren). Their common side effects include stomach upset, nausea, abdominal pain, diarrhea, and even bleeding ulcers. These medicines are frequently taken with food in order to minimize side effects. In some people with ankylosing spondylitis, inflammation of joints excluding the spine (such as the hips, knees, or ankles) becomes the major problem. Inflammation in these joints may not respond to NSAIDs alone. For these individuals, the addition of disease-modifying antirheumatic drugs (DMARDs) that suppress the body's immune system is considered. These medications, such as sulfasalazine (Azulfidine), may bring about long-term reduction of inflammation. An alternative to sulfasalazine that is somewhat more effective is methotrexate (Rheumatrex, Trexall), which can be administered orally or by injection. Frequent blood tests are performed during methotrexate treatment because of its potential for toxicity to the liver, which can even lead to cirrhosis, and toxicity to bone marrow, which can lead to severe anemia. Medical research has shown that for persistent ankylosing spondylitis with spinal involvement that is unresponsive to anti-inflammatory medications, both sulfasalazine and methotrexate are ineffective. Newer, effective medications for spine disease attack a messenger protein of inflammation called tumor necrosis factor (TNF). These TNF-blocking medications have been shown to be extremely effective for treating ankylosing spondylitis by stopping disease activity, decreasing inflammation, and improving spinal mobility. Examples of these TNF-blockers include etanercept (Enbrel), infliximab (Remicade), adalimumab (Humira), and golimumab (Simponi). In 2016, adalimumab (Humira) was approved for the treatment of uveitis (inflammation in the eyes). Several major points about the treatment of ankylosing spondylitis deserve emphasis. There is an early, underdiagnosed stage of spondylitis that occurs before plain X-ray testing can detect classic changes. Patients who are treated earlier respond better to treatments. Current disease-modifying drugs such as methotrexate, sulfasalazine, and leflunomide (Arava), which can be effective for joint inflammation of joints away from the spine, are not effective for spinal inflammation. If nonsteroidal anti-inflammatory drugs (NSAIDs) are not effective in a patient whose condition is dominated by spinal inflammation (and 50% do respond), then biologic medications that inhibit tumor necrosis factor (TNF inhibitors) are used. All TNF inhibitors, including Remicade, Enbrel, Humira, and Simponi can be effective in treating ankylosing spondylitis. The improvement that results for TNF inhibition is sustained during years of treatment. If the TNF inhibitors are discontinued, for whatever reason, relapse of disease occurs in virtually all patients within a year. If TNF inhibitor is then resumed, it is typically effective. Oral or injectable corticosteroids (cortisone) are potent anti-inflammatory agents and can effectively control spondylitis and other inflammations in the body. Unfortunately, corticosteroids can have serious side effects when used on a long-term basis. So they are typically used for short periods when possible. These side effects include cataracts, thinning of the skin and bones (osteoporosis), easy bruising, infections, diabetes, and destruction of large joints, such as the hips. Inflammation and diseases in other organs are treated separately. For example, inflammation of the iris of the eyes (iritis or uveitis) may require cortisone eyedrops (Pred Forte) and high doses of cortisone by mouth. Additionally, atropine eyedrops are often given to relax the muscles of the iris. Sometimes injections of cortisone into the affected eye are necessary when the inflammation is severe. Heart disease in patients with ankylosing spondylitis, such as heart block, may require a pacemaker placement or medications for congestive heart failure. Finally, orthopedic surgery may be required when there is severe disease of the hip joints and spine. The outlook for patients with ankylosing spondylitis is very much dependent upon the location and severity of its manifestations. The prognosis is best for those who maintain close monitoring with the treating doctors and who incorporate physical activities designed to maintain mobility. Quitting smoking is essential for the best long-term outcome. It has been found that people with ankylosing spondylitis have somewhat of an increased health risk for coronary artery disease. This increased risk appears to be caused by chronic inflammation. Therefore, it is important to optimize all modifiable cardiac risks, including elevated blood pressure and cholesterol. There is no prevention for this inherited (genetic) disease. Prevention measures are directed toward preventing complications of the disease with optimal treatments and monitoring for side effects of the treatments. Exercise can help to maintain flexibility. Ankylosing spondylitis and each of the spondyloarthropathies are areas of active health research. The relationship between infectious agents and the triggering of chronic inflammation is vigorously being pursued. Factors that perpetuate "autoimmunity" are being identified. The characteristics of the gene marker HLA-B27 are being further defined. In fact, there are now known to be seven different subtypes of HLA-B27. The impact of the recent discovery of the two additional genes, ARTS1 and IL23R, associated with ankylosing spondylitis (described above under "Causes") cannot be overstated. These genes seem to play a role in influencing immune function. It is anticipated that by understanding the effects of each of these known genes researchers will make significant progress in discovering a cure for ankylosing spondylitis. As more about the precise mechanisms these genes use to influence the immune system is understood, the discovery of a cure will be possible. Moreover, results of ongoing research will lead to a better understanding and optimal treatment options of the entire group of diseases collectively known as spondyloarthropathies. For more information about ankylosing spondylitis, please visit the Arthritis Foundation (http://www.arthritis.org/) and contact local branches of the Arthritis Foundation and/or Spondylitis Association of America for support group information. Primer on the Rheumatic Diseases. Springer, edited by John H. Klippel, et al., 2008. Kelley's Textbook of Rheumatology. W B Saunders Co, edited by Shaun Ruddy, et al., 2000. American College of Rheumatology Annual Scientific National Meeting, 2005-8. What is ankylosing spondylitis? Learn about symptoms, diet, treatment, prognosis, definition, pictures, and tests for ankylosing spondylitis? The symptoms of ankylosing spondylitis can vary greatly from patient to patient. What were your symptoms at the onset of your disease? What was the treatment for your ankylosing spondylitis? Please describe your experience with ankylosing spondylitis. Do you or a relative have ankylosing spondylitis? Please share its progression, along with treatments. What tests led to a diagnosis of ankylosing spondylitis? What is ankylosing spondylitis? Take this quiz to learn the causes, symptoms, and treatments for this painful disorder. Heel spurs -- pointed, bony outgrowths of the heel -- are caused by localized soft-tissue inflammation and can be located at the back of the heel or under the heel, beneath the sole of the foot. Heel spurs are treated with ice application and anti-inflammatory medications. Orthotics may also provide some relief.